a large self-catering kitchen, common room with fireplace, plenty of free hot power showers(no queueing!) bed linens provided. A light breakfast is available on request at no additional cost. We are located approx 400m from the nearest bus stop and are less than 5 minutes walk to pubs, restaurants, cafe, craft shops, and Doolin Cave Visitor pick-up. Boat trips to the Aran Islands from Doolin Pier, Burren walks, Cliffs of Moher Visitor Experience, are just a few of the local attractions. Aillwee Caves, Burren Centre, Burren Perfumery, Lahinch Leisure Centre, are some of the possibilities for daytrips by car making Doolin the ideal base for your holiday in Clare. Gerard and family look forward to welcoming you! -Free tea and coffee making facilities. -Music and Set Dance lessons; if you play an instrument and are interested in an Irish Traditional Music lesson, please contact us to arrange it before your stay. Gerard also gives set dancing lessons on request. Check-in between 15:00 to 21:00 If you would like to check-in prior to 15:00 please make arrangements before arrival. Flanagan’s is a very nice and clean place to stay, with all the facilities you need. It’s a little bit far from the centre but the best pubs are near this hostel. The owner will make you feel welcome with all the stories he is telling en the music he is making. We had a wonderful time at the hostel and it made our stay in Doolin even greater. Cute hostel with really kind host! 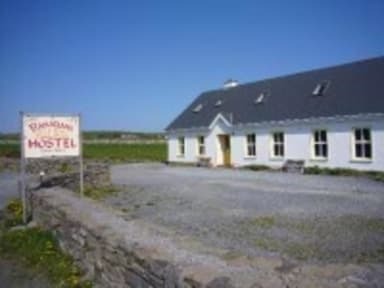 Cozy common room and clean bathrooms, From Doolin you can walk to the Cliffs of Moher which is an amazing hike! There's also some nice pubs close to the hostel for a pint, food and live music!